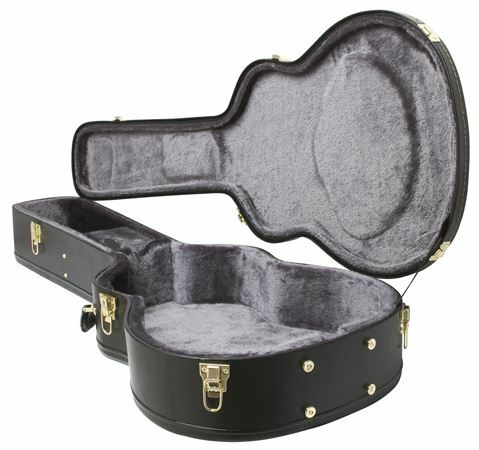 Shop Epiphone EJUMBO Deluxe Acoustic Guitar Case For EJ200 Broadway Regent from AMS with 0% Interest Payment Plans and Free Shipping. This is a high-quality Epiphone case, specifically designed to fit all Epiphone Jumo body styles - EJ200, EJ200CE, Broadway archtops and L5 archtop guitars. If you own an EJ200, or have ever owned a jumbo, you know that it can be tough to find a great case that fits properly. We're thrilled to offer this very impressive Epiphone case that's custom fit for the EJ. Beautiful case fits my larger body guitars like a glove!!!! Great product..well worth the money. Very sturdy and super plush to protect my instrument. I love it! Nice case that holds my Epi J200 perfectly. Thanks AMS for the fast shipping! Absolutely necessary and worth the cost! In my opinion, this case is functional and aesthetically pleasing to the eye. The interior is soft and is a fairly tight fit. I like it! The hardshell case fits my guitar perfect And i would recommend it to everyone. Heavy, well constructed case. Sewn not glued. I trust this case to take care of my baby. I purchased this case for my Eppiphone Jumbo and it is worth every penny . Excellent case ! I bought two of these cases and both of them have an issue closing properly. For the price that it's being charged, I expect better quality. The inside is nice and it does it's job but it is a pain to close.